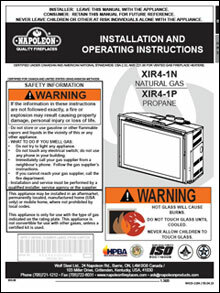 The Napoleon XIR4 is an impressive, deluxe direct vent infrared gas insert entertains a new level of fire and comfort. The XIR4 offers Napoleon’s modulating dual burner system that results in a firebox filled with a stunning triple flame pattern, and allows the option of independently operating the front burner for when max BTU’s are not necessary.With up to 40,000 BTU’s, an impressive 563 sq. in. clean face viewing area and a multitude of designer accessories, it’s a perfect choice for larger rooms where a passion for luxury is evident.